First and foremost, a bathroom must be safe and functional. This means that the bathroom lighting should be adequate for both day and night use; the faucets should not leak; drains should clear freely and the toilet should not run. Leaks can not only waste water and drive up utility bills, if left unchecked they can cause thousands of dollars in water damage to your home. It’s best to address any leaks as soon as you notice them so the problem can be resolved before any damage occurs. Because the bathroom is a moist and humid environment there is potential for mold and mildew. Make sure your exhaust fan functions properly or crack a window when bathing to help with air circulation. Look for textiles with mildew-resistant properties and seek out bath mats with anti-skid backing to reduce the potential for slips and falls. Experts recommend replacing the shower curtain and liner on a regular basis to further reduce the possibility of mildew. 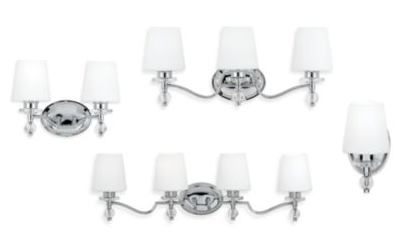 Purchase these Polished Chrome Bath Light Fixtures from Bedbathandbeyond.com for around $149.99. It’s also available at Target.com but for a slightly higher price $299.99. When replacing the shower curtain it is a good opportunity to upgrade to top quality shower curtain hooks or rings; the better quality ones will slide freely on the rod which reduces the likelihood of wear and tears caused by constant tugging on a balky shower curtain or liner. Another way to both reduce potential for mold and mildew and make sure both the shower curtain and liner slide freely is to install double shower curtain and liner rods so there is adequate ventilation and air space between the curtain and liner. Look for a quick-dry shower curtain liner with a weighted hem to reduce annoying billowing.